This paleo pasta is such a fun idea for a nice gluten free dinner. 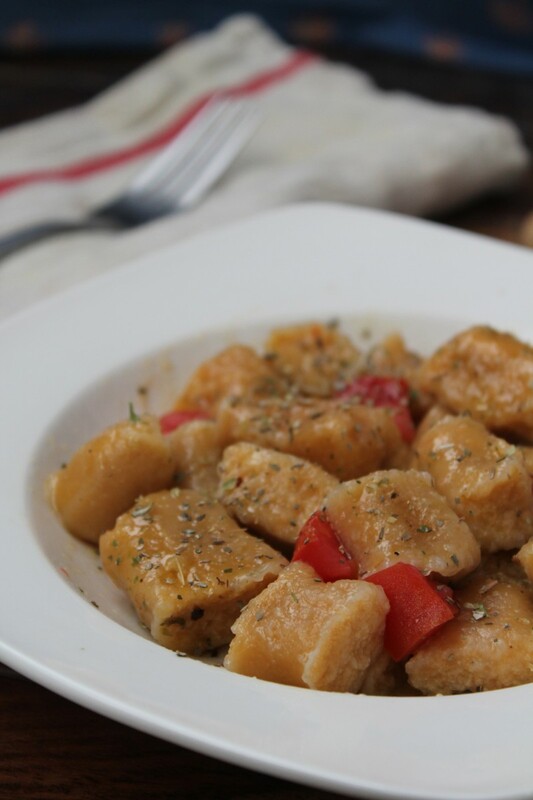 The butternut gnocchi has a delicious doughy pasta-like texture and a yummy savory flavor. 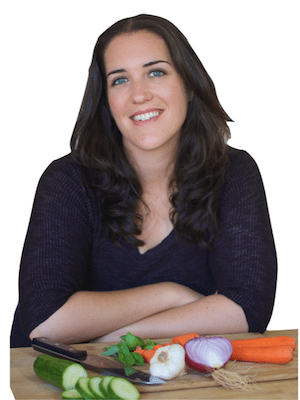 I am seriously so excited to share this recipe will you all! I wasn’t really sure how it would turn out when I started experimenting, but I was surprised at the amazing results. 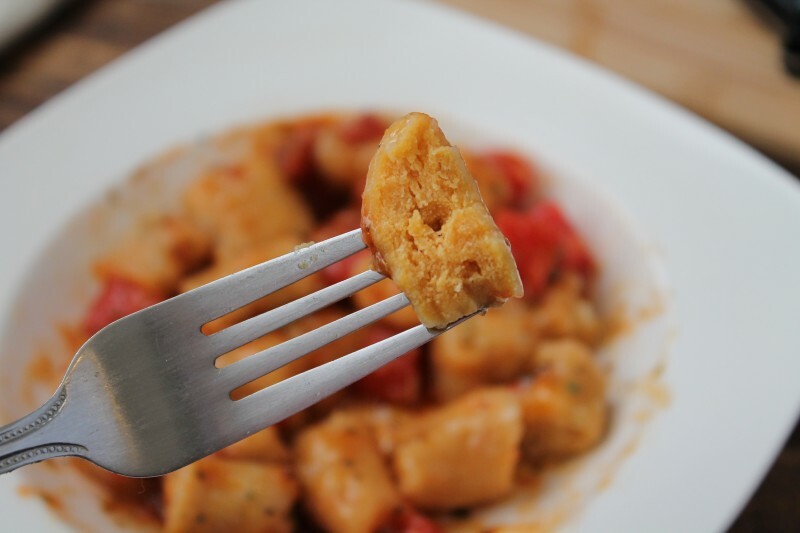 This paleo pasta has a delicious doughy pasta-like texture and a yummy savory flavor. Enjoy! Begin by roasting the butternut squash and sweet potato (use 1 large sweet potato) in a 400° oven for 45-70 minutes or until the squash is tender and you can poke a fork through the flesh. *Tip: Most recipes suggest cutting the squash in half and scooping out the seeds and membrane then brushing it with olive oil and placing it in the oven to roast it. To save time, I just put the whole squash in the oven for the same amount of time, then feel when the squash is soft when you squeeze it with an oven mitt to know when it’s done. Once it’s done, let it cool, then slice in half and scoop out the seeds and membrane. Either way will work for this recipe. The sweet potato can be put in the oven on an oven safe dish whole. Once the squash and sweet potato are done, remove from the oven and allow to cool. Once they have sufficiently cooled, scoop out 1/2 cup of the butternut squash flesh and measure out 1/4 cup of the sweet potato flesh and put it in a dish towel and squeeze out as much excess liquid as possible. Then add it to a food processor or mixing bowl. You're going to want to use a food processor or hand blender so you can smooth out the squash and potato into a smooth puree. Add the remaining ingredients, then use the food processor or hand blender to smooth the mixture so there are no lumps. The dough should be thick enough so that you can squeeze it into a shape with your hand and it holds the shape. If it's not firm enough add 1 tbsp of arrowroot at a time until you get the right consistency. Cover a large cutting board or countertop with ample arrowroot. Coat your hands with arrowroot and take about one handful of the mixture and roll it into a tubular shape. Roll it on the countertop until it's in the shape of a rope. 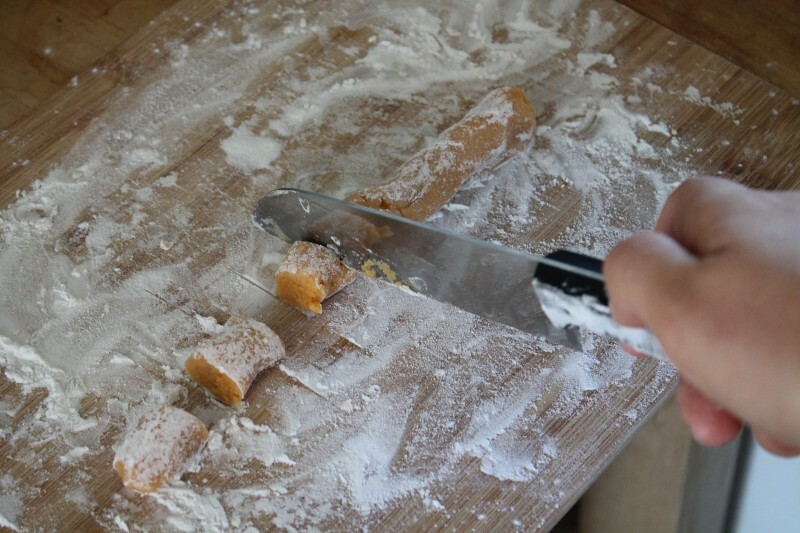 Use a knife to cut the rope into small bite sized pieces. Bring a large pot of water with a dash of salt in it to a boil. 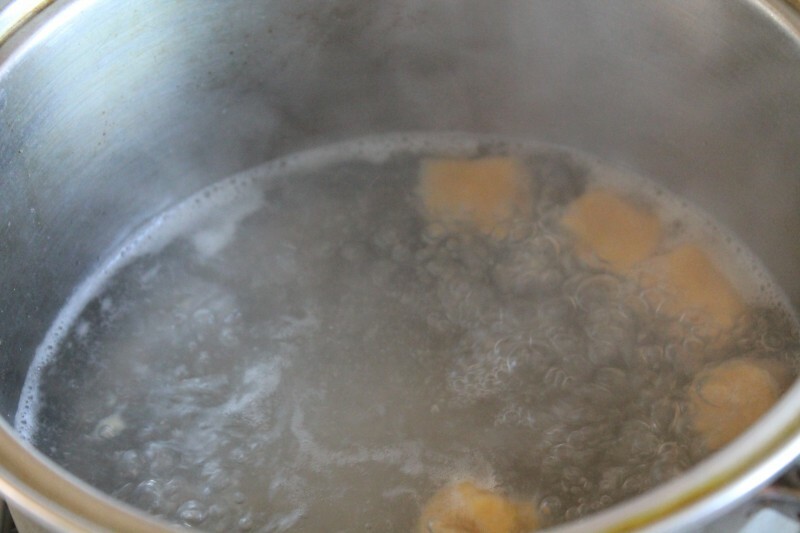 Once it is at a rolling boil, drop the pieces of "pasta" into the water, do not crowd the pot. Do a few batches at a time so they don't stick together. They will just take a few minutes to cook, when they are done they will float to the top surface of the water. 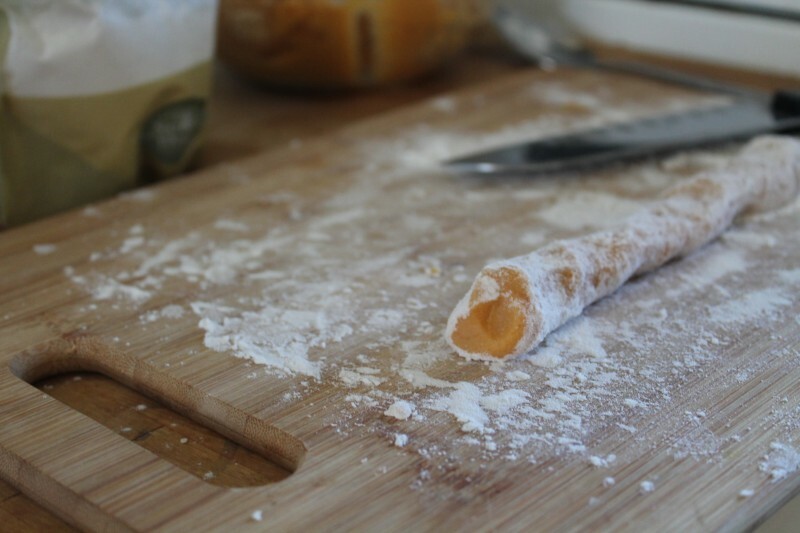 Continue rolling ropes with the dough, cutting and boiling until the dough is gone. Add tomato sauce, pesto, olive oil, sautéed vegetables or whatever you like to have on your pasta! I’m not sure how well it would hold-up to being re-boiled. Give it a try and let me know how it turns out! When I make gnocchi I freeze them uncooked on a sheet pan until hardened and then place them in a ziploc bag. I am not sure how the coconut flour would work but usually it works great. These look wonderful!! But, I tried to make them tonight…without success :(. They were way too wet to form together at all to roll them. I tried adding more coconut flour and more starch, but no luck. Any suggestions??? Did you follow the recipe exactly? The dough will be a little wet, but as you roll it with a good amount of arrowroot it will become stiffer. THESE LOOK FANTASTIC! 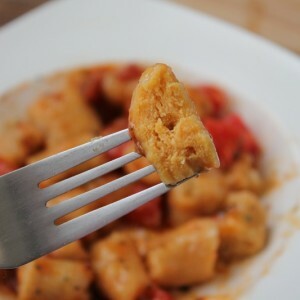 !…Could you roll them on the backside of a fork to obtain the little “ridged” factor in regular potato gnocchi?…I remember the “nonna” of my Italian roommate used to form them in that way!…Perfect pleaser fare for all during the Holidays and family gatherings…Thanks so much for the welcome inspiration! Thanks Donna, they’re pretty tasty! You could probably put some ridges in there, but they are quite soft and delicate before you cook them, so be careful. Would this work with pumpkin instead of squash?? And is there an alternative to arrowroot please?? Hi there! These look fabulous. I made them last night and when I dropped them in the boiling water, they disintegrated! I followed the recipe exactly so I’m not sure what happened, BUT I then tried baking them in the oven instead and it worked! I thought I’d share that in case others have a similar issue. I popped them in a 350 degree oven for 15 minutes and they came out nicely. Thanks for sharing the recipe! I tried this last night with so/so results. I would not consider what I started with a “dough” in any way… more a paste or batter. 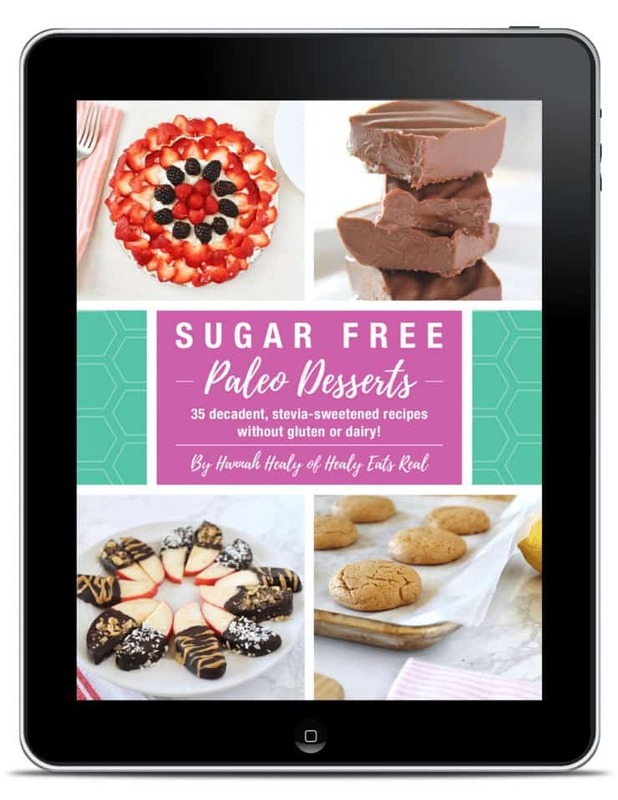 What you would recommend if it’s that wet, adding more arrowroot or coconut flour? I did my best to “roll” it out and cut them, then froze them for a short time help them set up. As soon as it hit the hot water about 1/2 of them completely disintegrated, the other 1/2 cooked to an odd gummy consistency. I’m curious how much arrowroot powder you consider “ample” as I used close to 1/2 a bag! The ones that were edible were tasty, but can’t say it was worth the mess and effort. Just made these…taste good! Even my husband was impressed. I had to use tapioca starch since I didn’t have arrowroot. 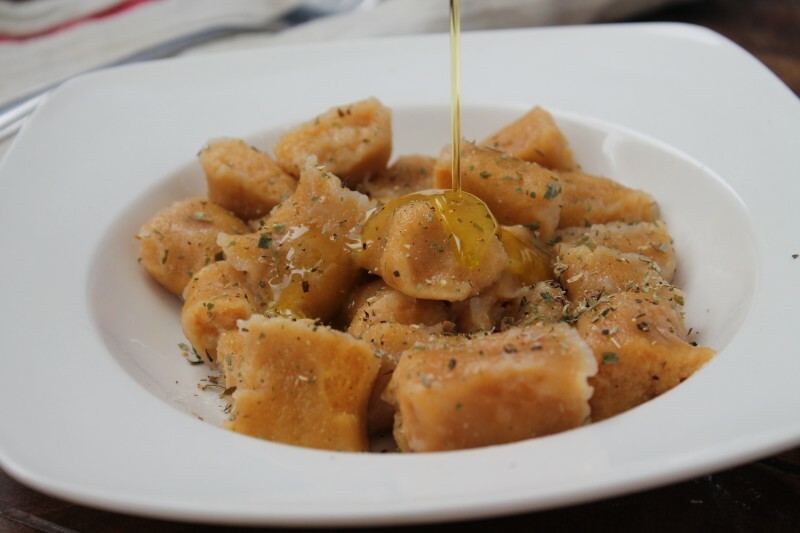 I had to use a lot of starch in order to make the texture of the gnocchi close to the real thing and it didn’t fall apart when I boil them. Unfortunately, I didn’t measure how much starch. I kept adding until I get the right texture. Hi. It there anything that I could use instead of arrowroot powder? Thanks? The only other thing that would work is tapioca flour.